The group poses at their campsite with West Point Cadet Mitchell Valenza. Image courtesy of Venturing Crew 276. 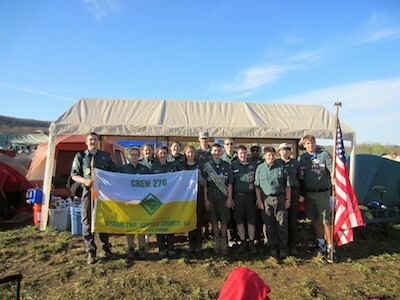 SUSSEX COUNTY, NJ – On May 1st through 3rd, Byram Venturing Crew 276 attended the 53rd West Point Camporee. Overall, it was a great experience that we were fortunate enough to be selected to attend. Out of over 16,000 applications West Point received, Crew 276 was one of only about 250 units selected to attend. Typically on Friday nights of camping, you don’t do too much; you set up your tent, have a snack, play some games and go to bed. This is because the main activities occur on Saturday. However, West Point was not your typical scout camping trip. Our unit did the Bull Hill hike to get into the camporee. This hike is described by the cadets as a challenging 3 mile hike. After hiking into the camping area, we set up our site. Venturing Crew 276’s group photo on the Bull Hill Hike. 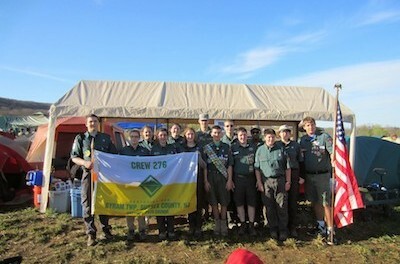 Photo courtesy of Venturing Crew 276. Saturday morning was my favorite part of the trip, but not everyone’s. We did PT led by our assigned cadet! PT stands for “Physical Training” and it is part of a service member’s every day routine. We did some push-ups, sit ups, squats, mountain climbers and many more exercises. After we finished PT, we had breakfast with our cadet and then headed up to colors. Colors was different because in addition to the morning announcements and flag ceremony, there were some demonstrations. Infantry units demonstrated how to effectively take control of an enemy position without suffering any casualties or injuries. Next, members of West Point’s Black Knights jump team jumped out of a helicopter a couple thousand feet up. They then proceeded to maneuver to the landing zone right in front of us! There were 4 members jumping with the last one carrying the American Flag. Finally, a helicopter pilot flew very low to the ground right by us to perform a fly by. After colors we headed to the various stations. First we went to the KIMs game activity. KIM stands for “Keep In Mind”, but at West Point they put a twist on it. Normally in KIMs game you have many different items under a tarp and participants have a short time period to memorize them and recall them when instructed. We started a distance away and had to run to the tarp. On the trail to the tarp, there were also items we had to KIM. When we got to the tarp we had to memorize additional items. Then came West Point’s twist; you had to do sit ups and pushups while memorizing the items. What was a great bonus about this station was it was run by a cadet from Sparta NJ, Dylan Panicucci. After we finished the KIMs game, the crew members split up into groups and explored the area and participated in many events. During the weekend, while talking to the cadets, we got to do challenges for “Brass”. Brass is a term for the special pins that cadets wear on their uniform displaying what year in school they are in. It was great to talk to the cadets and hear what they think of the Army and Scouts. I had many different conversations with cadets and also did some challenges for the Brass. Challenges included memorizing and reciting the Army’s Soldiers Creed, Army’s Warriors Ethos, planking, doing pushups and more. I had many great conversations and got a lot of Brass in the process. While we were having lunch, our campsite was judged on how clean and orderly it was. 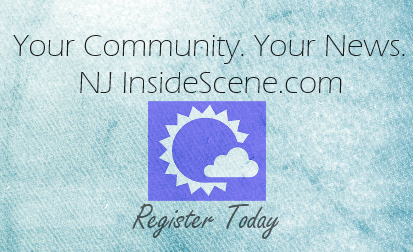 While we were talking to our judge, we discovered he is a cadet from Branchville NJ. After lunch the Crew headed back out to participate in more stations. Some went to the Judo station and learned about the origins of Judo and different flips. Others went to the TAC challenge and participated in that. During the TAC challenge, you had to crawl through mud, under simulated barbed-wire while carrying a dummy weapon. The goal was to rescue a hostage. The robotics area had many different types of robots from robots used to spy and get information to robots used to disarm bombs. Some members even got to operate the robots. After dinner we headed to the bonfire. 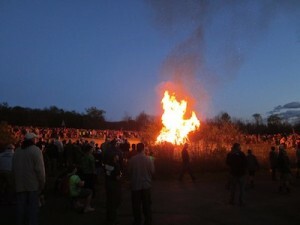 This bonfire was huge and you could see it from your campsite which is about ¼ mile from the bonfire. There was music and a dance competition by the fire. After the bonfire the Crew mingled with other scouts before heading to bed. The bonfire roars at the event. Photo courtesy of Venturing Crew 276. After Sunday morning’s closing ceremony, we waited for all of the other units to leave so we could be the last unit to leave. While we were waiting, we helped the cadets cleanup the camping area by collecting trash and water containers. Our crew would like to thank one cadet in particular, Mitch Valenza, for being a great friend and guide to us while we were at the camporee. We had a lot of fun and learned much from Mitch in the short time we were together. We would also like to congratulate him and wish him luck as he enters his sophomore year at West Point.